Every year the Candlelighters Childhood Cancer Foundation of Nevada recognizes local children with cancer to be ambassadors for its annual Superhero 5K with Chet Buchanan at the Mountain’s Edge Master Planned Community. They’re chosen for their courage in dealing with cancer and inspiring others. These brave children, along with hundreds of others and their families battling childhood cancer, depend on the support of the nonprofit Candlelighters for various emotional assistance, quality of life and financial support programs. This year’s Superhero Ambassadors are Alexa Garin, 7, who has kidney cancer, and James Kish, 10, who had a brain tumor. The Angel Ambassador is Cooper Ricciardi, who was 18 years old when he lost his battle with leukemia. Upon discovering Alexa’s cancer in December 2015, her family remained a team to help Alexa beat her cancer with positivity, prayer and love and continuing to live their lives. Alexa has remained a pillar of strength and looks forward to becoming an actress, dancer and singer. Two weeks after his seventh birthday, James was rushed to the emergency room and his cancer was discovered. After two brain surgeries, 33 sessions of radiation, two years of nightly chemo pills, and two years of inpatient chemotherapy, he beat the odds and is a cancer survivor. James is now playing soccer and training his new golden retriever, Zeke, to become a therapy dog that he can take to the hospital to visit other children. In 2016, Cooper was one of 19 children in Southern Nevada who were taken by a form of childhood cancer. He loved spending time with his family and friends, and also loved playing basketball, video games, and the card game UNO. Cooper was extremely active and curious about everything. He was hilarious, kind and loving all at the same time. The Superhero 5K is Candlelighters’ largest fundraiser of the year, and will be Saturday, Sept. 15 at the 80-acre Exploration Park, located at 9275 S. Buffalo Drive, just south of the Mountain’s Edge main entrance. There’s still time to register for the race or walk, form a team, and come to the event for a morning of fun. You also can meet Alexa and James. 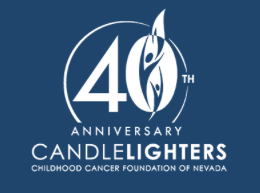 Registration deadlines are Sept. 14 by 5 p.m. for online registration, or in person on race day at 6:30 a.m.
For registration and information, visit www.candlelightersnv.org or (702) 737-1919.